1 What Does it Really Mean to Forgive? 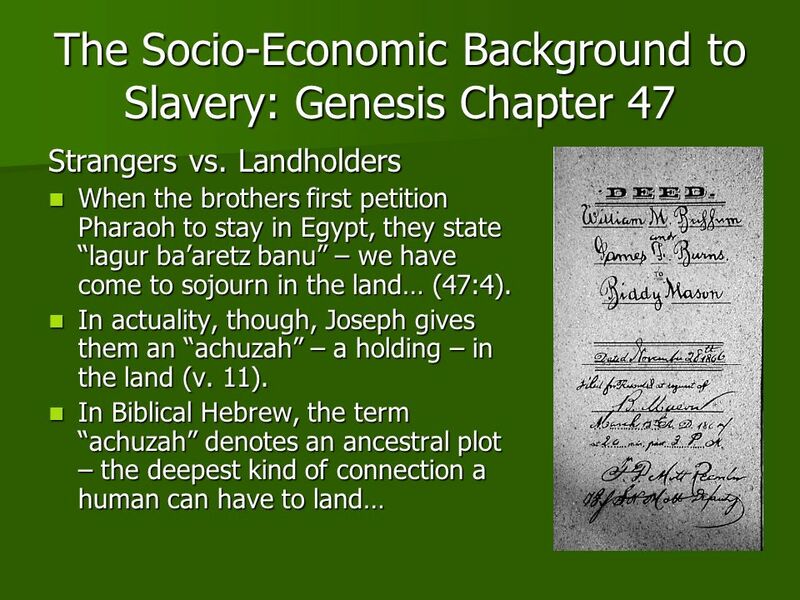 Slavery comes out of nowhere in the Book of Exodus. Why, and how? 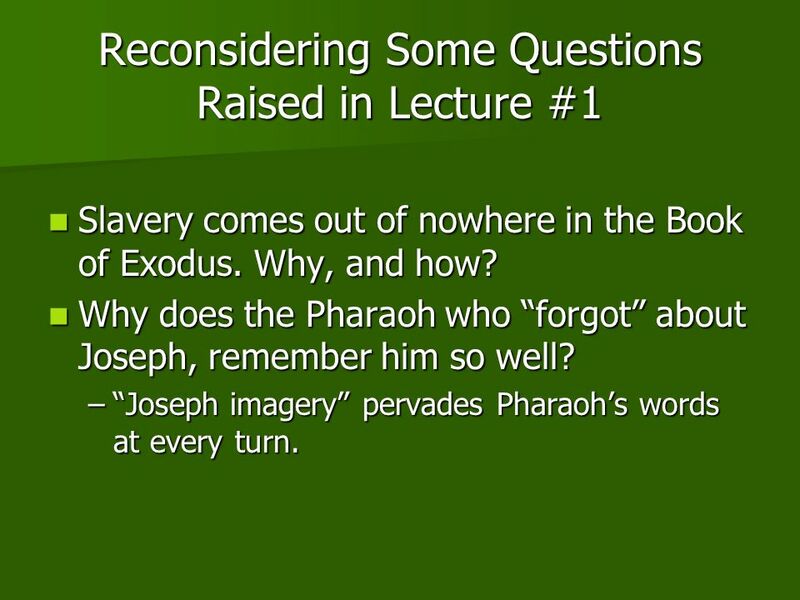 Why does the Pharaoh who “forgot” about Joseph, remember him so well? 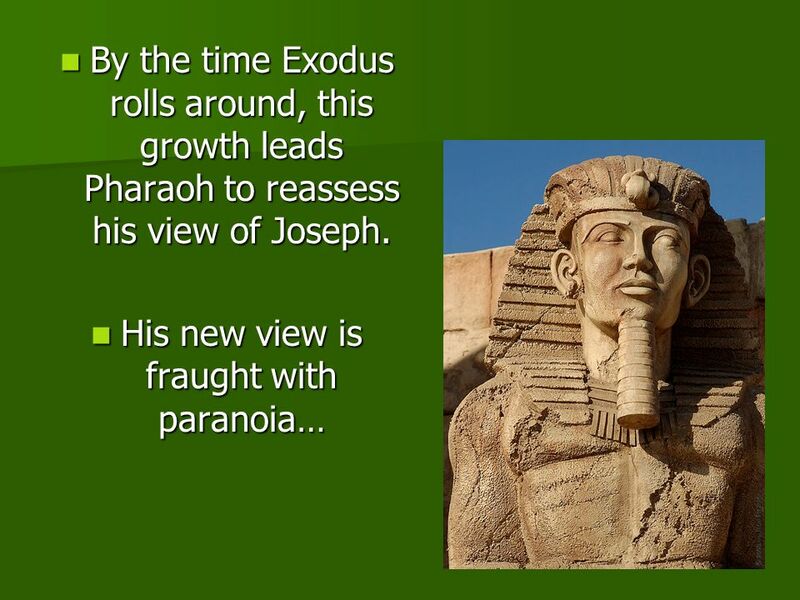 “Joseph imagery” pervades Pharaoh’s words at every turn. 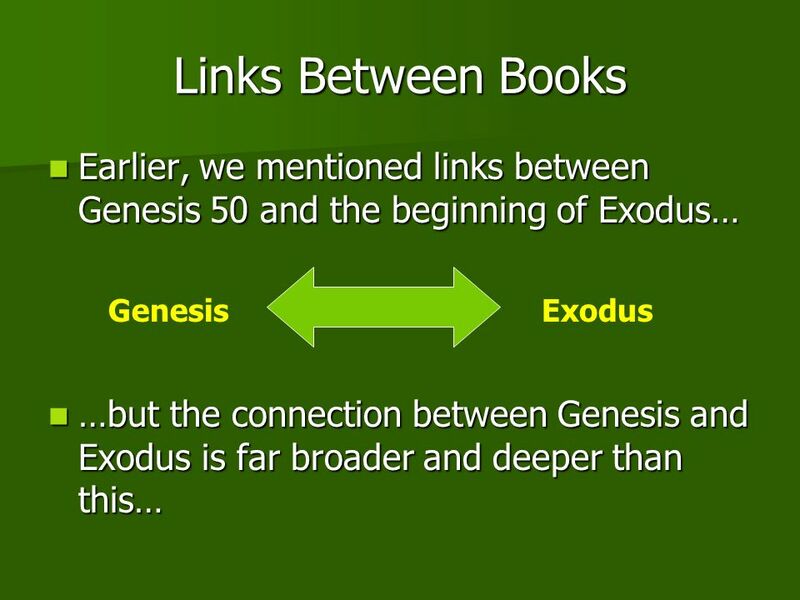 between the first chapter of Exodus, and two earlier chpaters in Genesis – Chapters fifty and forty seven. 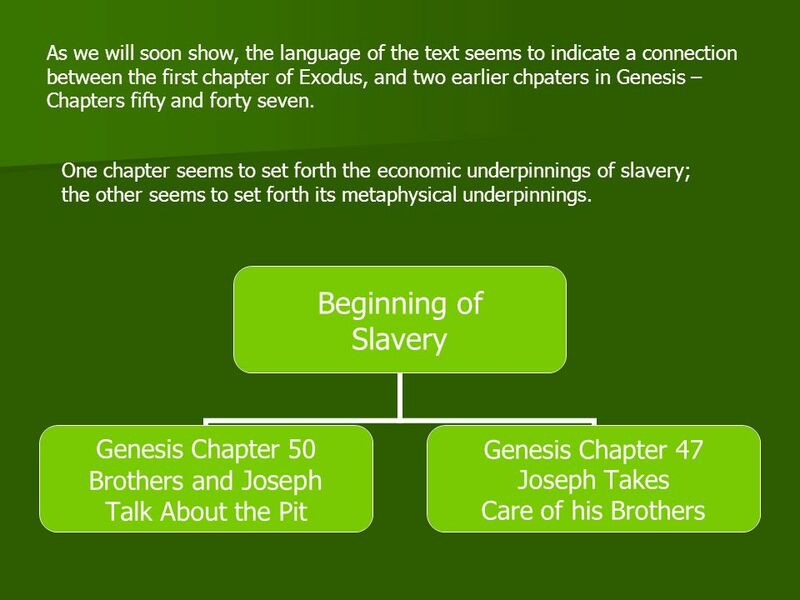 One chapter seems to set forth the economic underpinnings of slavery; the other seems to set forth its metaphysical underpinnings. 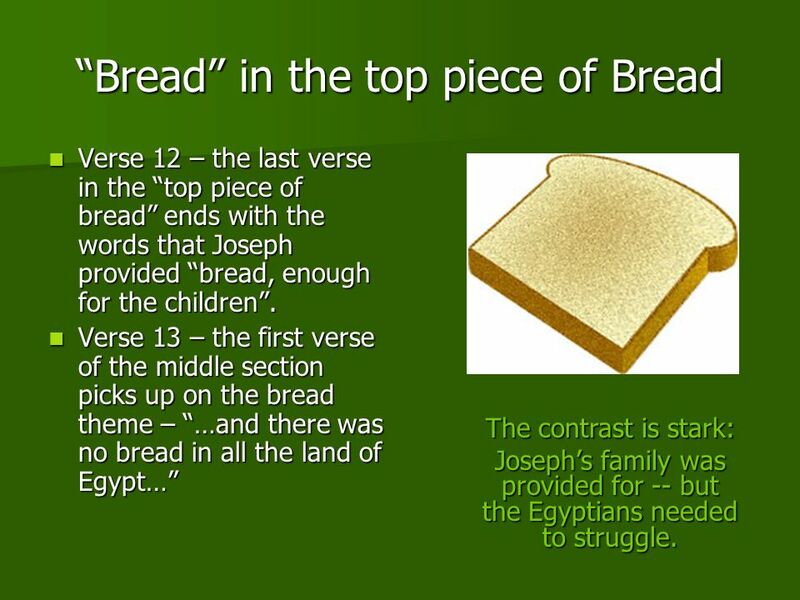 Verse 12 – the last verse in the “top piece of bread” ends with the words that Joseph provided “bread, enough for the children”. 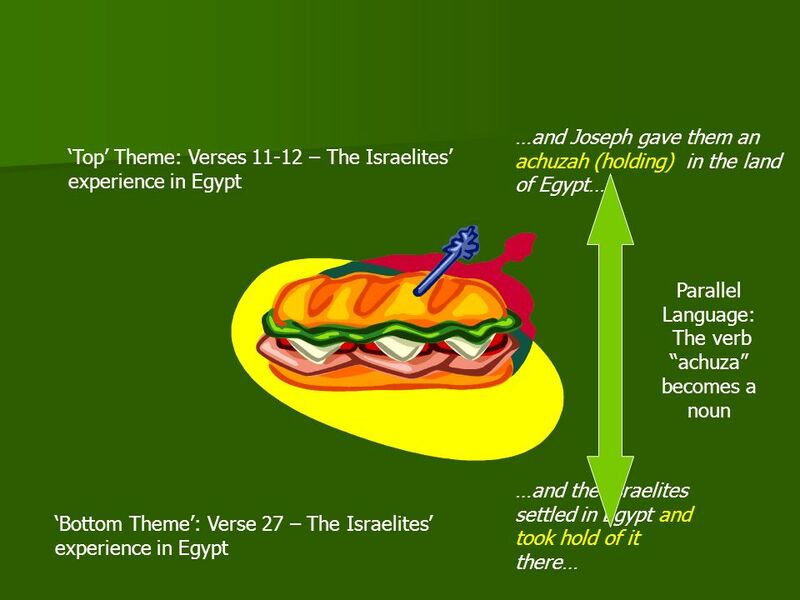 Verse 13 – the first verse of the middle section picks up on the bread theme – “…and there was no bread in all the land of Egypt…” The contrast is stark: Joseph’s family was provided for -- but the Egyptians needed to struggle. 11 Shepherds and Sheep The impoverished masses plead with Joseph for food. 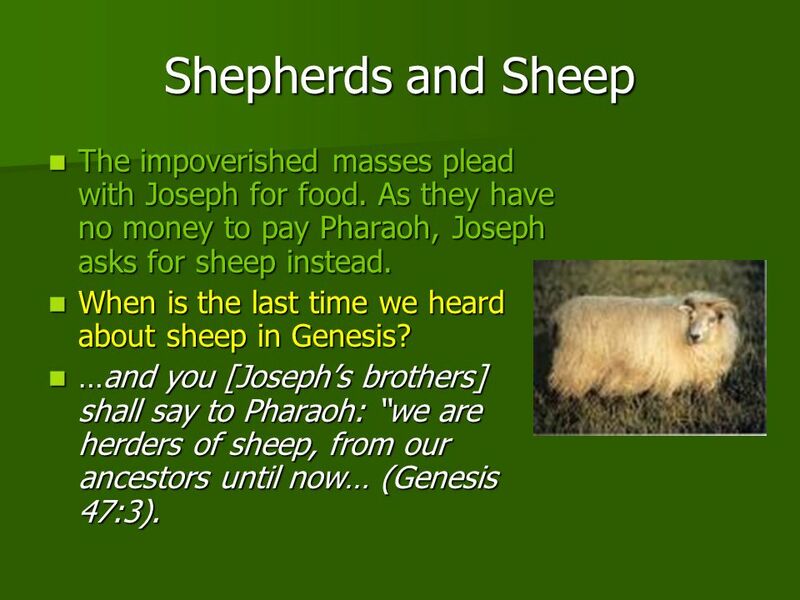 As they have no money to pay Pharaoh, Joseph asks for sheep instead. 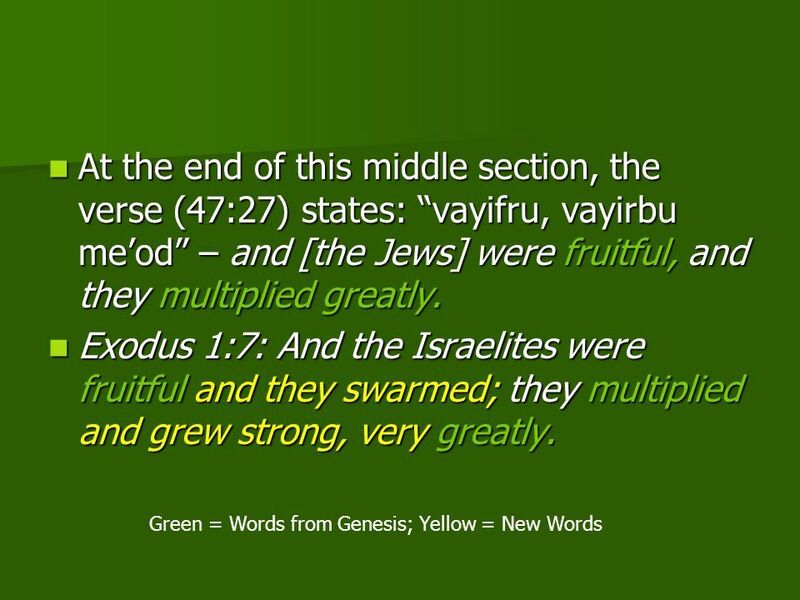 When is the last time we heard about sheep in Genesis? 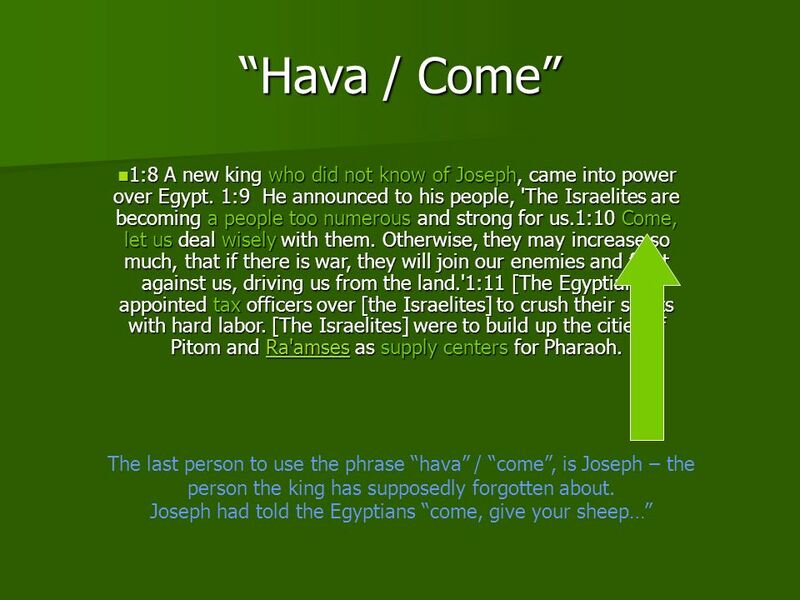 …and you [Joseph’s brothers] shall say to Pharaoh: “we are herders of sheep, from our ancestors until now… (Genesis 47:3). 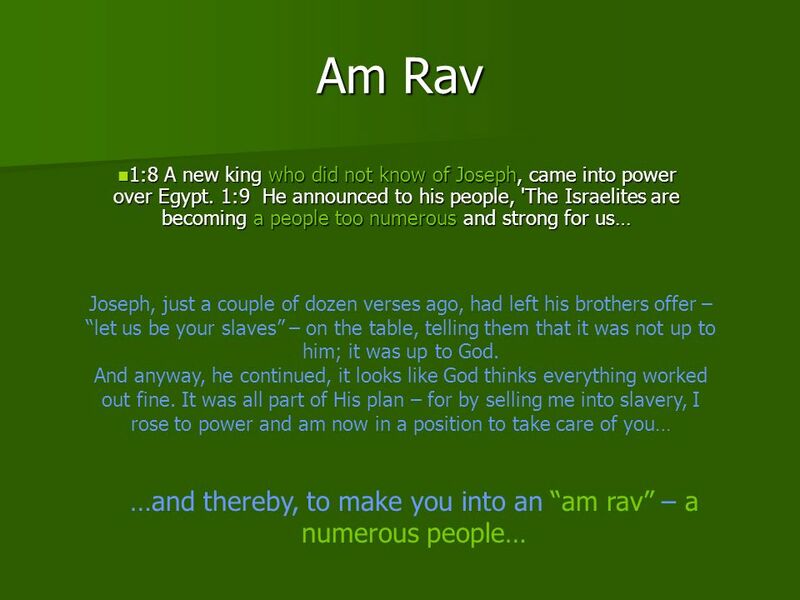 The Jews settle in the land of Ra’amses. 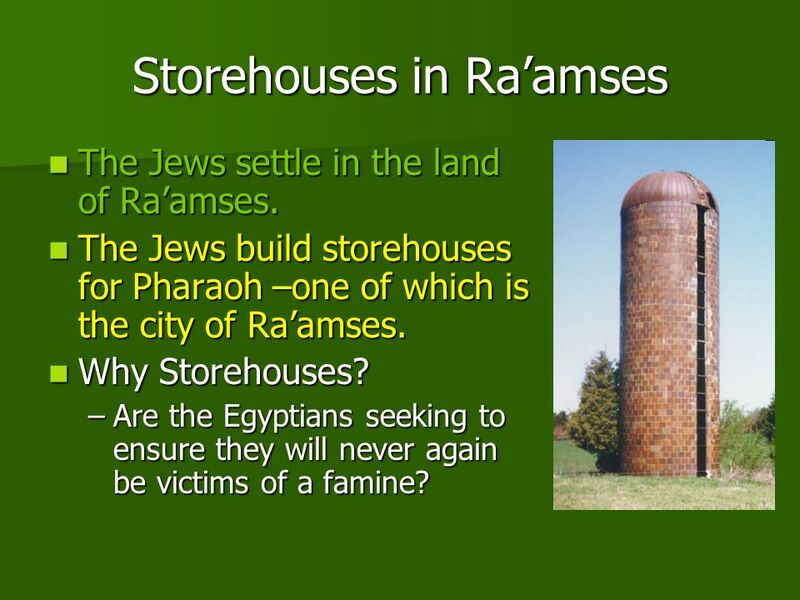 The Jews build storehouses for Pharaoh –one of which is the city of Ra’amses. Why Storehouses? 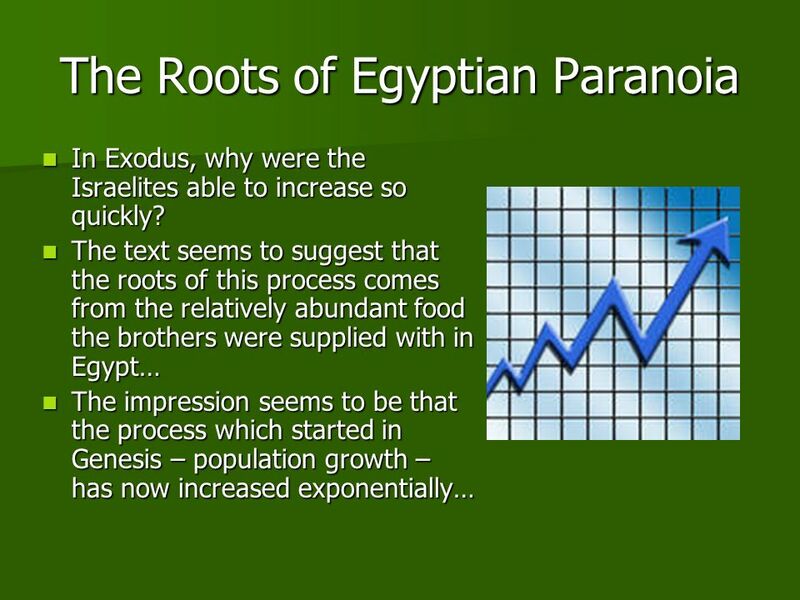 Are the Egyptians seeking to ensure they will never again be victims of a famine? 1:8 A new king who did not know of Joseph, came into power over Egypt. 1:9 He announced to his people, 'The Israelites are becoming a people too numerous and strong for us.1:10 Come, let us deal wisely with them. Otherwise, they may increase so much, that if there is war, they will add on to our enemies and fight against us, driving us from the land. 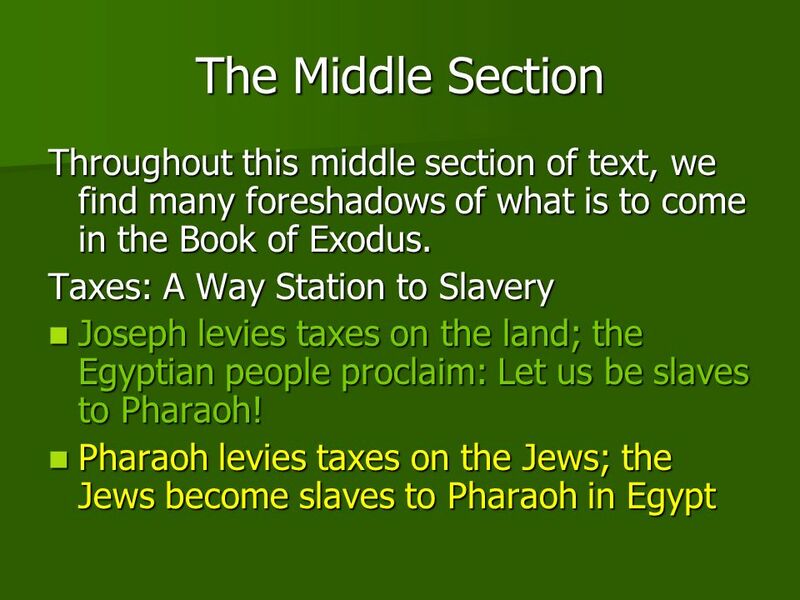 '1:11 [The Egyptians] appointed tax officers over [the Israelites] to crush their spirits with hard labor. [The Israelites] were to build up the cities of Pitom and Ra'amses as supply centers for Pharaoh. 1:8 A new king who did not know of Joseph, came into power over Egypt. 1:9 He announced to his people, 'The Israelites are becoming a people too numerous and strong for us.1:10 Come, let us deal wisely with them. Otherwise, they may increase so much, that if there is war, they will join our enemies and fight against us, driving us from the land. 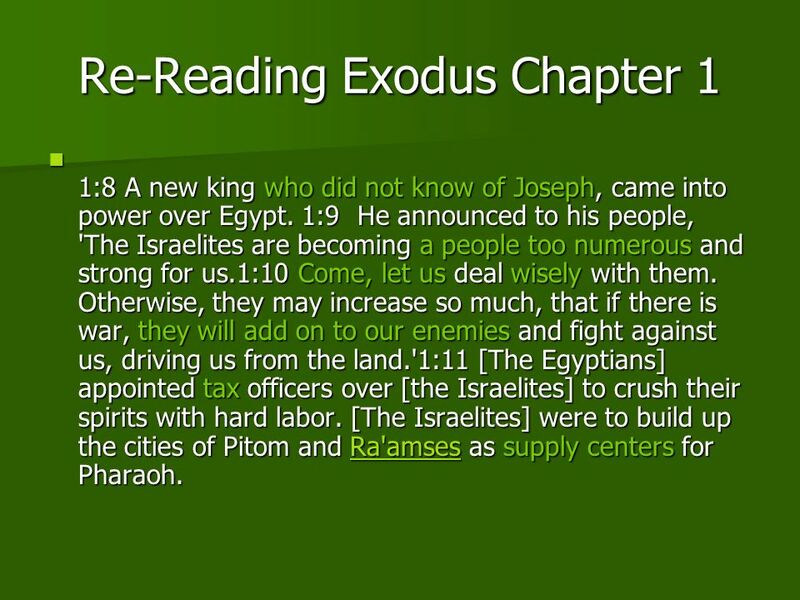 '1:11 [The Egyptians] appointed tax officers over [the Israelites] to crush their spirits with hard labor. 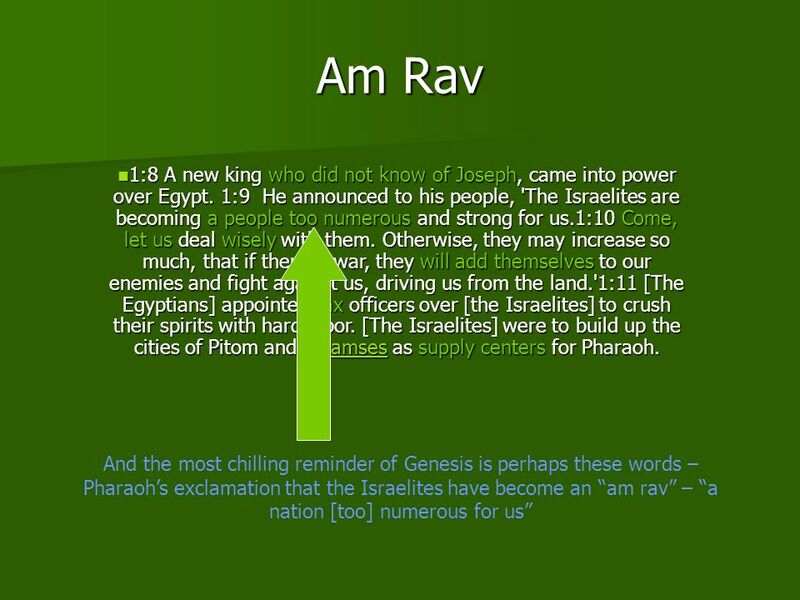 [The Israelites] were to build up the cities of Pitom and Ra'amses as supply centers for Pharaoh. 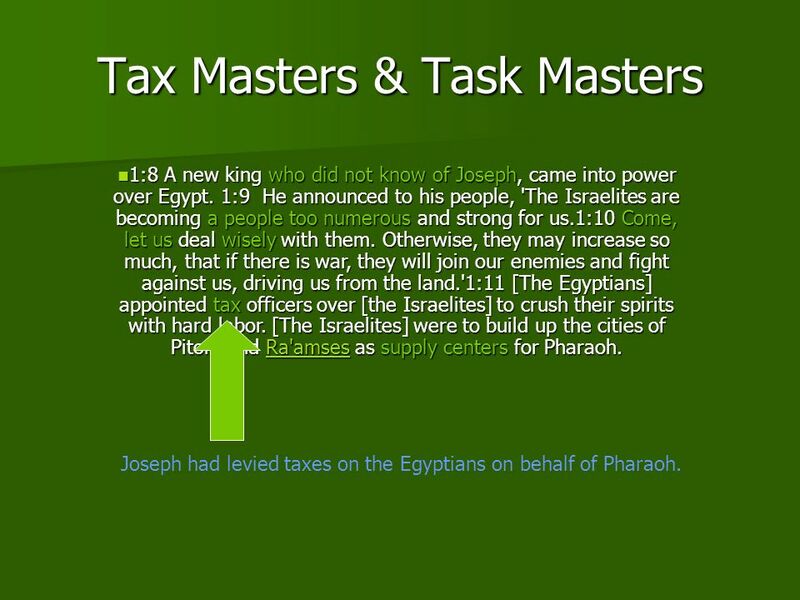 Joseph had levied taxes on the Egyptians on behalf of Pharaoh. 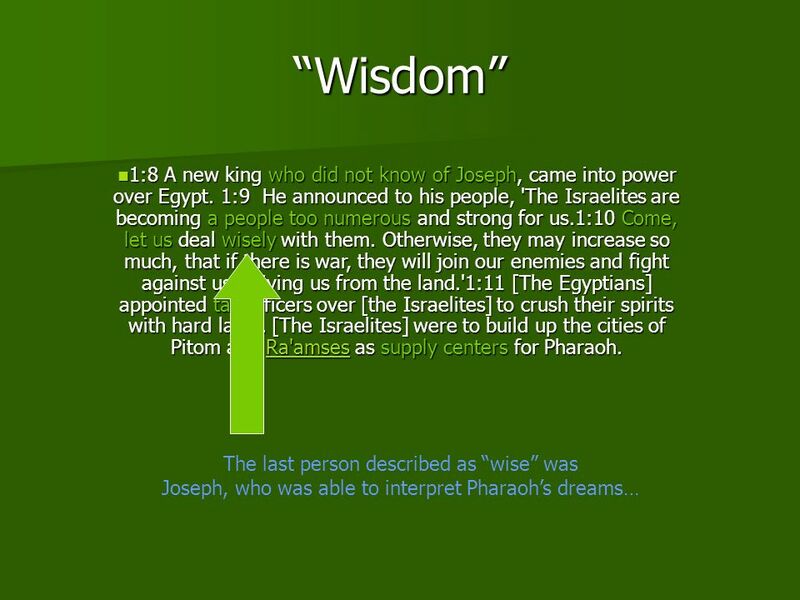 23 Joseph and “Venosaf” 1:8 A new king who did not know of Joseph, came into power over Egypt. 1:9 He announced to his people, 'The Israelites are becoming a people too numerous and strong for us.1:10 Come, let us deal wisely with them. Otherwise, they may increase so much, that if there is war, they will add themselves to our enemies and fight against us, driving us from the land. 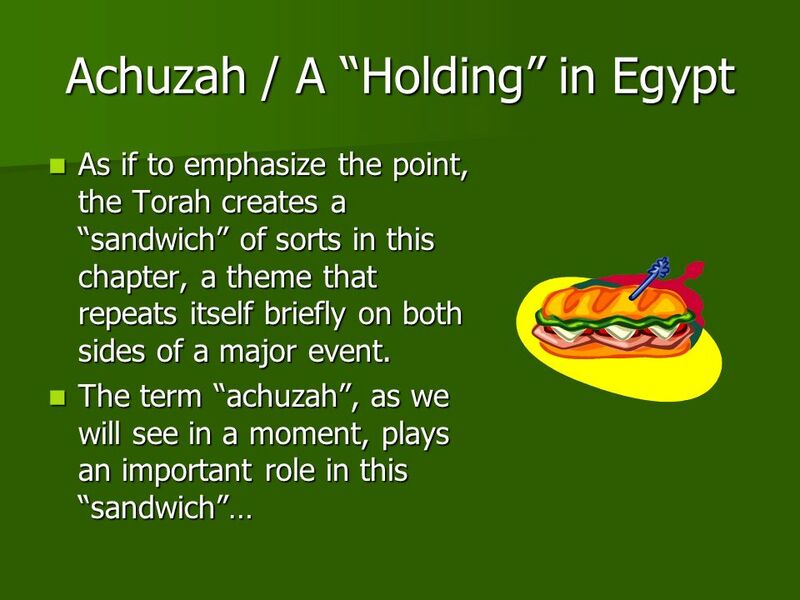 '1:11 [The Egyptians] appointed tax officers over [the Israelites] to crush their spirits with hard labor. 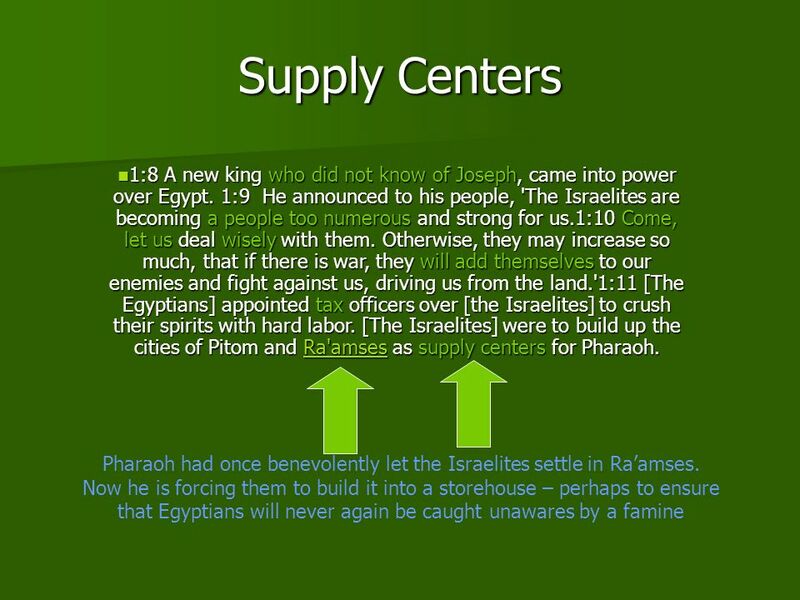 [The Israelites] were to build up the cities of Pitom and Ra'amses as supply centers for Pharaoh. 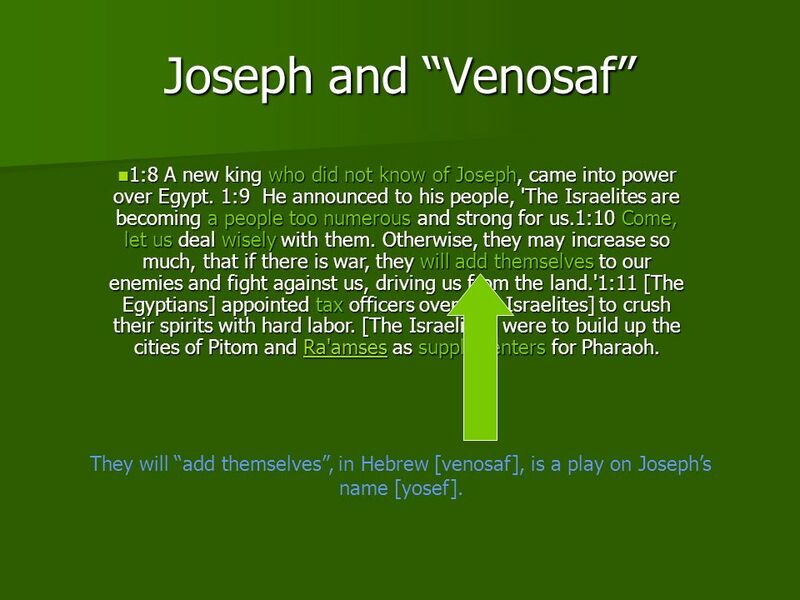 They will “add themselves”, in Hebrew [venosaf], is a play on Joseph’s name [yosef]. 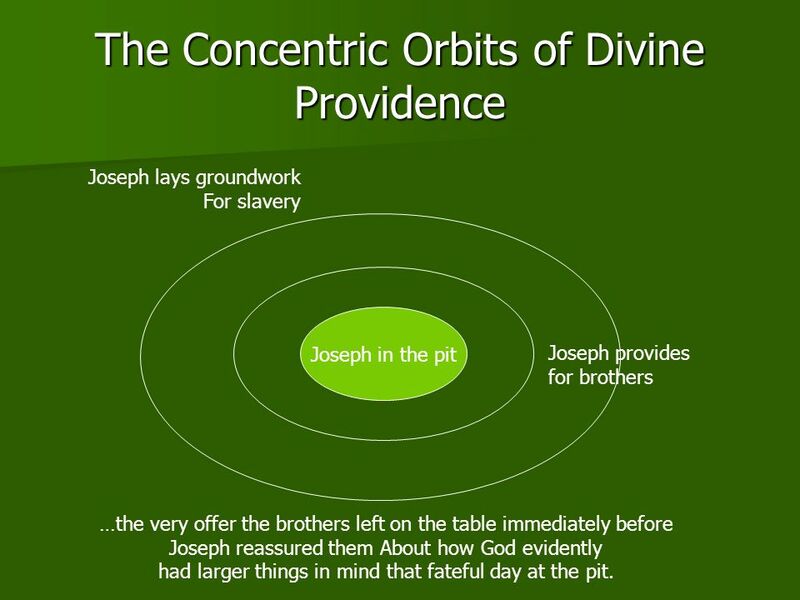 Joseph lays groundwork For slavery Joseph in the pit Joseph provides for brothers …the very offer the brothers left on the table immediately before Joseph reassured them About how God evidently had larger things in mind that fateful day at the pit. 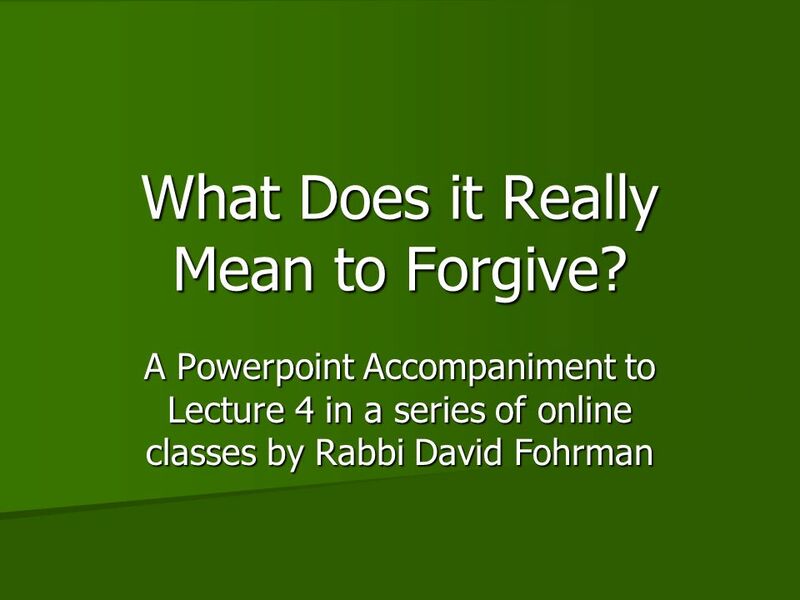 Download ppt "What Does it Really Mean to Forgive?" Fear is natural, some fears are healthy. Fear is natural, some fears are healthy. "And we know that all things work together for good to those that love God, to those who are the called according to His purpose“ Romans 8:28. Waiting on God Lessons from the Life of Moses. This is God’s Word for my life in this Place and at this Time. Today I am a new creation in Christ, I am. 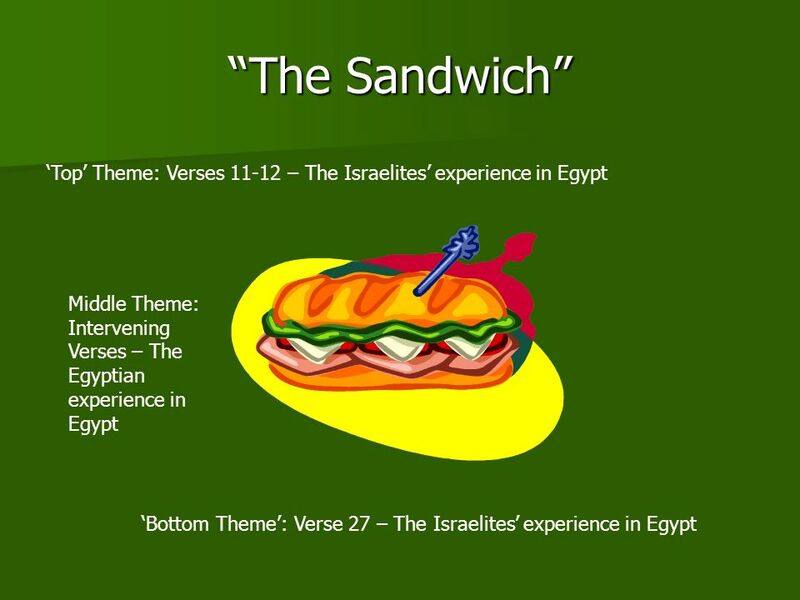 Lesson #1 Exodus 1:1-22 These are the names of the sons of Israel who went to Egypt with Jacob, each with his family: Reuben Dan Simeon Naphtali. Riding the Roller-Coaster of Hope. Favoured Sold. 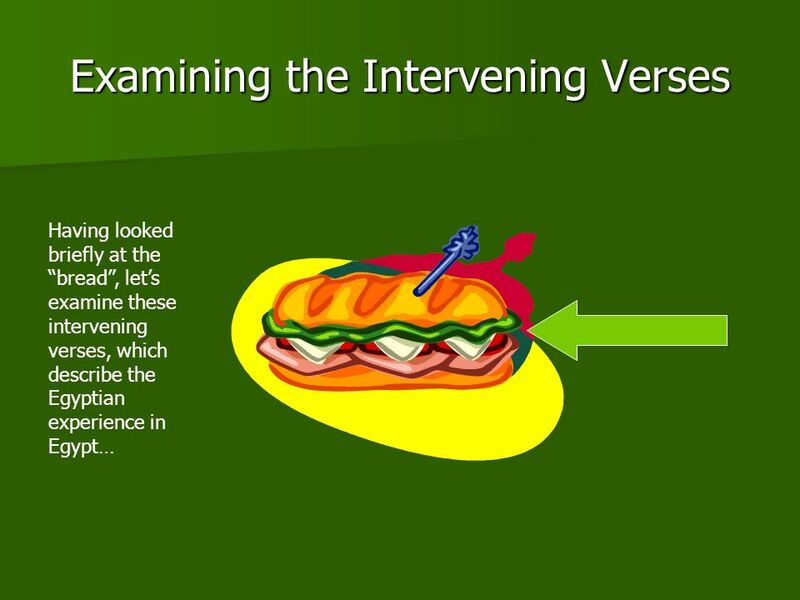 Living in the Gap: Persevering Genesis 40. Some time later, the cupbearer and the baker of the king of Egypt offended their master, the king of Egypt. Happy New Life!!. Church Vision Real Life, Love, and Family. El Shaddai Ministries January 10, 2015 Welcome to Sabbath Service! Tevet 19, A Special Plan for your life? 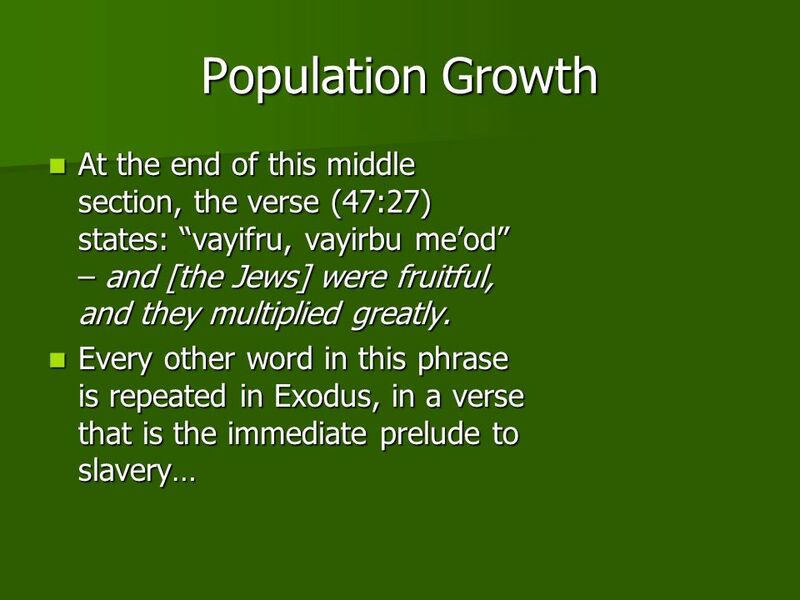 SHEMOT Exodus 1:1-6:1 Learnings this. Overcome Hard Times November 9. We need your advice … What is your number one survival tip to prepare for a crisis? A tragedy or crisis can happen at. 37Now the proposal seemed good to Pharaoh and to all his servants. 38Then Pharaoh said to his servants, "Can we find a man like this, in whom is a divine. Providence of God. Foresight and forethought which enables the infinite God to create a universe that he could control by his laws and give man the freedom.